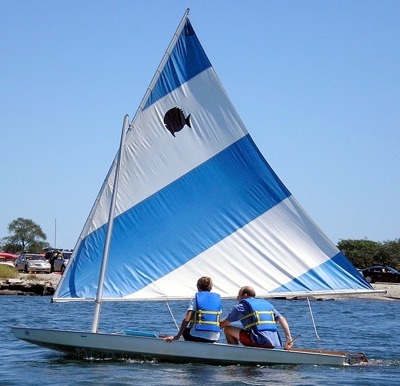 The Sunfish dinghy is a popular one-design sailing dinghy which was developed in the 1950s. It can be sailed with one, two, or three persons, but is most often sailed singlehanded (one person). At 13 feet 9 inches (4.2 m) in length and 130 lb (59 kg) in weight, the Sunfish is easily carried in a luggage rack or a light trailer. The Sunfish is used as a day sailer or a racing boat, with over 1000 racing events every year worldwide. Key to the Sunfish's success are simplicity and low cost. A Sunfish can be sailed using only a single line (the sheet) and the tiller. A second line (the halyard) is used to raise and lower the sail. A Sunfish setup for racing will typically add outhaul, cunningham, a gooseneck quick-release adjuster, and vang lines. The lateen sail is fixed to the spars and is stored by simply wrapping the sail around the spars, or by rolling the sail up parallel to the spars. A single person can easily handle the Sunfish. The "board boat" design, with its small, self bailing cockpit, resists swamping. The boat can carry up to 3 small people. The wide, hard-chined hull allows it to plane and achieve a Portsmouth handicap of 99.6, which is very low for a boat of its size. A new Sunfish costs about US$3395-$3820, with older used models in working condition going for under US$500. Because of its low cost and simplicity (it is often regarded as the simplest boat to sail, and is widely used for teaching sailing) it is also perhaps the most popular sailboat class ever designed; over 500,000 Sunfish have been built. The Sunfish was inducted into the American Sailboat Hall of Fame in 1995. The great popularity of the Sunfish has led to many imitators; Starfish, Aquafin, Phantom, and Big Fish are all boats virtually identical to the Sunfish.